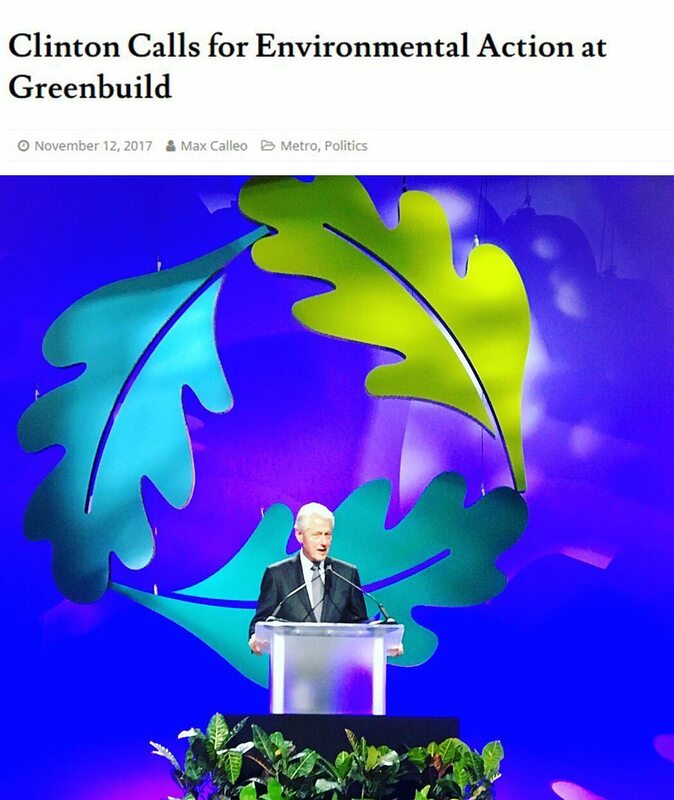 It took part on Novermber 9th the 2017 Greenbuild Plenary, the world’s largest conference and expo dedicated to green building, with the presence of Bill Clinton, the 42nd U.S. President and the founder of Clinton Foundation, organization which aims to finding the solutions for environmental issues (The Clinton Climate Initiative, The Clinton Development Initiative). The crucial themes discussed were climate change, the need to act for sustainability and the importance of green building and trees, the reason why Mahesh Ramanujam, president and CEO of the U.S. Green Building Council, mentioned Stefano Boeri and his innovative concept of Vertical Forest. Introducing the conference, Bill Clinton said that he does not want future generations fighting an endless battle against climate change. Instead, as he explained in speech given on he wants each citizen of the world to try. In fact, he wants them to go further, and go all in. In occasion of the Greenbuild Plenary, Clinton led a variety of activists architects, builders, politicians, and developers to discuss building a better future in this environmental expo. The crowd of environmentally driven participants emptied from the bustling and expansive expo hall, exhibiting brands from Kohler to LG, and entered into the grand ballroom for Thursday’s 2017 Greenbuild Plenary. Three leaves in a circular pattern, the Greenbuild logo, hung on the back wall of the stage, as a reminder of the purpose of this conference caring for the planet that provides so much for mankind. George Bandy, the vice president of sustainability for Mohawk, a flooring solutions company, opened the plenary by reminding listeners of the common ties linking them together. We are a family. We are bound by a common interest in using the built environment to shape a more sustainable future for everyone, Bandy said. Just like any family, we are stronger, health[ier], and more balanced when we take the time to listen to each other and try to better understand each other. We are all in. Bandy said that the leaders who would take the stage for the rest of the night understand the importance of innovation and the power of personal connections. Mahesh Ramanujam (president and CEO of the U.S. Green Building Council) took the stage next, explaining that this kind of environmental movement is built by millions, not a select few, over decades. In movements like these, ordinary people, such as educators, business owners, and everyone between, are the heroes of the movement, even if they aren’t the ones that you see on the nightly news or in your Twitter feed. Ramanujam introduced the concept of vertical forests to the discussion. Stefano Boeri, an Italian architect, pioneered an ecosystem created by hundreds of trees growing on a building. This environment has the capability to remove carbon dioxide and pollutants from the air. This setup could be employed in countries like China, to clean the air of the most polluted country in the world. also highlighted Lava Mae as an example, a groundbreaking program established to provide showers to homeless people, in an effort to improve hygiene. It is important to focus all of our energy not fighting the old but on building the new, Ramanujam said. I know that we can do that, and I am all in. So I have only one more question, are you? Rick Fedrizzi, the chairman and CEO of International Well-Building Institute, talked about his mission trip to Haiti, sponsored by the Clinton Foundation. After an earth-shattering earthquake, Haiti required immense aid to rebuild, eliciting a response from other nations. Fedrizzi and others jumped into action as well, building an orphanage in Port-au-Prince that meet LEED’s platinum standard. We would as an organization for the very first time stop talking about what was possible and actually get our hands dirty, use our brain, and our brawn, and our hearts, Fedrizzi said. To conclude the opening plenary, Bill Clinton delivered a riveting keynote speech. Clinton acknowledged the inspirational nature of Haiti’s children’s center, and the aspiration to have a world totally powered by the sun and the wind and other natural sources. But to Clinton, having aspirations like this are essential, as they allow individuals to put [their] bricks on the right path during a fleeting life. I do not want to bet my grandchildren’s future on our winning an endless dogfight of different trial, Clinton said. We have got to keep trying to build a future of shared responsibility and of shared opportunities and of shared prosperity. According to Clinton, the most important lesson that his daughter Chelsea claims she was taught as a child is that it is always important to get caught trying. You, with the lives you have chosen the live represent the apotheosis of social choice and personal freedom and with that comes great responsibility. Most of all, the responsibility to get caught trying, Clinton said.